Fresh off the back of the BRITS, DJ Fresh has thrown his support behind up-and-coming hip-hop artist Iggy Azalea as the industry’s ‘next big thing’. The BRITS nominee gave his seal of approval to Iggy ahead of her performance at the Universal Music BRITS party, hosted by BACARDÍ at the Soho House pop-up in London. 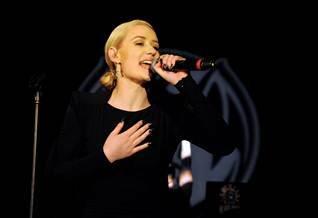 The event provided a stage for Iggy to showcase her talent and was attended by some of the music industry’s biggest names, including: Taylor Swift, Mumford and Sons, Emeli Sandé, Paloma Faith, Jessie J, Frank Ocean and many more. Double BRIT Award nomineeJessie Ware, who took part in a BACARDÍ initiative which supports emerging artists in the music industry, expressed her support for such platforms that provide exposure for new artists. This exclusive web video features interviews with DJ Fresh, Jessie Ware and Iggy Azalea, as well as exclusive behind the scenes footage from the Universal Music BRITS after-party.